Hanson continues their tradition of high quality unloaders with Posi-Trac. 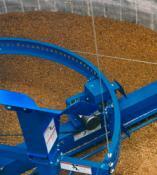 Equipped with a 6-foot heavy duty drive ring, heavy channel frame and dual augers. 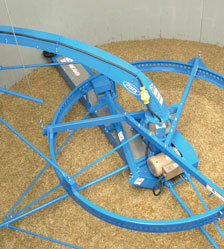 The Posi-Trac provides smooth, positive unloading day in and day out. Hanson's reputation for high quality materials and attention to details, make the Posi-Trac one of the industry's "Best Buys." The Hanson Enduro 28" Blower features 1 3/8" Adjustable Pillow Block Bearings for allowing easy adjustment for the tip clearance, large cast iron paddles, a 28" diameter housing for maximum blowing capacity, 1/4" AR Plate backwrapper and removable top cover. Each blower paddle is attached by a large 1" hardened pin. 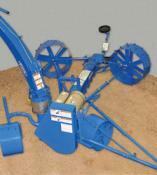 24" Turbo Blower uses a stainless steel backwrap. A 1 3/8" shaft with high quality flange bearings. An excellent blower in many conditions. Differential-Drive Transmission Gears are made of a special manganese bronze for long-lasting, dependable performance to handle frozen, hard-packed silage. Tapered roller bearings on all shaft ends. We manufacture all our own gears to maintain quality. Heavy-duty Drive Unit with an adjustable ratchet clutch.